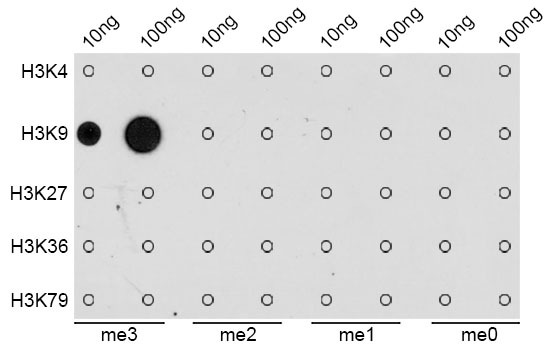 Small volumes of anti-H3K9me3 antibody vial(s) may occasionally become entrapped in the seal of the product vial during shipment and storage. If necessary, briefly centrifuge the vial on a tabletop centrifuge to dislodge any liquid in the container`s cap. Certain products may require to ship with dry ice and additional dry ice fee may apply. Western blot analysis of extracts of various cell lines, using TriMethyl-Histone H3-K9 antibody at 1:1000 dilution. 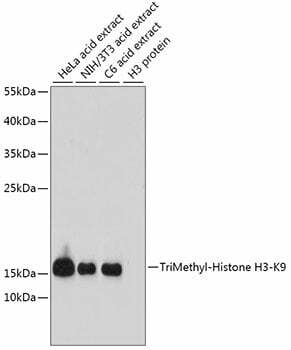 Dot-blot analysis of all sorts of methylation peptides using TriMethyl-Histone H3-K9 antibody. 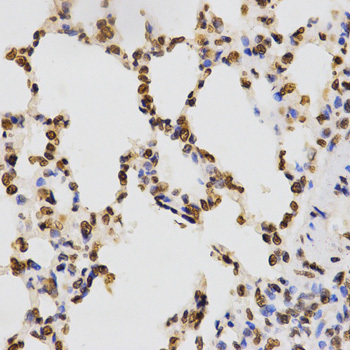 Immunohistochemistry of paraffin-embedded rat lung using TriMethyl-Histone H3-K9 antibody at dilution of 1:200 (40x lens). 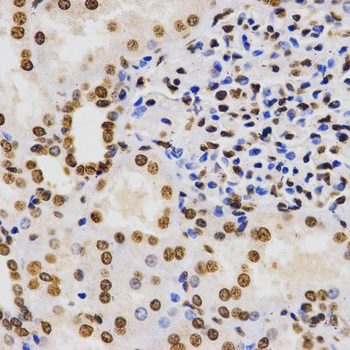 Immunohistochemistry of paraffin-embedded human kidney using TriMethyl-Histone H3-K9 antibody at dilution of 1:200 (40x lens). 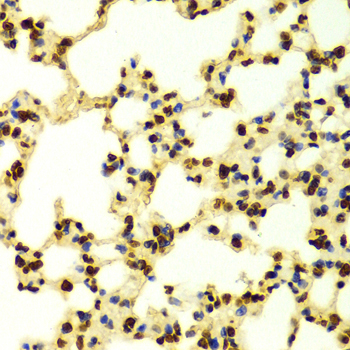 Immunohistochemistry of paraffin-embedded human lung cancer using TriMethyl-Histone H3-K9 antibody at dilution of 1:200 (40x lens). 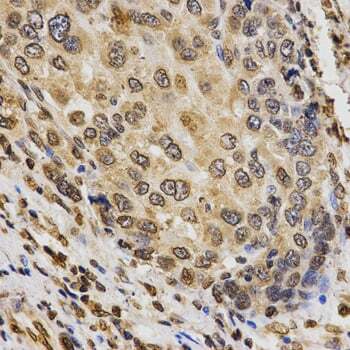 Immunohistochemistry of paraffin-embedded human liver cancer using TriMethyl-Histone H3-K9 antibody at dilution of 1:200 (40x lens). 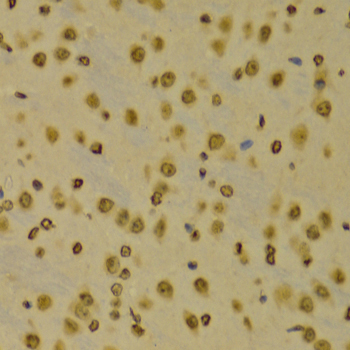 Immunohistochemistry of paraffin-embedded Mouse brain using TriMethyl-Histone H3-K9 antibody at dilution of 1:100 (40x lens). 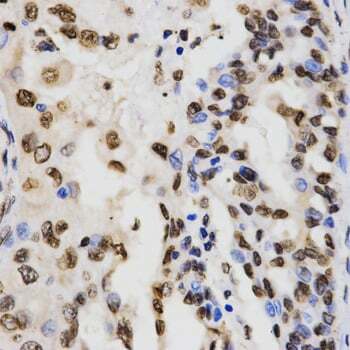 Immunohistochemistry of paraffin-embedded Mouse lung using TriMethyl-Histone H3-K9 antibody at dilution of 1:100 (40x lens). 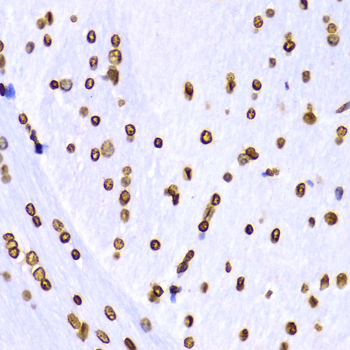 Immunohistochemistry of paraffin-embedded Rat brain using TriMethyl-Histone H3-K9 antibody at dilution of 1:100 (40x lens). NCBI/Uniprot data below describe general gene information for H3K9me3. It may not necessarily be applicable to this product.